"I will give you what you need for today - nothing more, nothing less." That's what I heard whispered to my soul last week, cutting through my worries and anxieties, putting to rest my heart's frenzy. "I will give you what you need for today." I have a struggle that I feel is not uncommon to A-type personalities and mothers: that feeling first thing in the morning of "I have WAY too much to do today. There's no way I'll get everything done." It's this fear associated with not having the time, finances, resources, or energy I need to do what needs to be done. And it starts my day with a handicap because I feel like I am falling behind before I have even begun. I don't know where I learned it or how I started thinking this way, but ever since high school I can look back and see a pattern of worrying that I was going to fall short that day of what was needed from me. Sometimes that was stressing out about homework, or youth group tasks or the amount of chores I had. But now it looks like trying to keep my home in working order, keeping my husband's shirts wrinkle-free, finishing up this semester, nesting for a baby coming, struggling not to be tired, getting dinner ready, and still finding time to pursue my dreams of blogging and making a few bucks by doing what I love. Not to mention the budgeting. Oh, the budgeting! Where does this struggle come from? Ultimately, it comes from the belief that I am doing things on my own. It comes from the belief that the Lord is there in my quiet times with Him in the morning, and then He sends me off into my day to figure out the rest on my own. It comes from the belief that the Lord hasn't already decided what needs to be done today and what doesn't. It comes from the belief that it's "all on me." It comes from the belief that I don't have a good heavenly father that has promised to give me everything I need for the day. 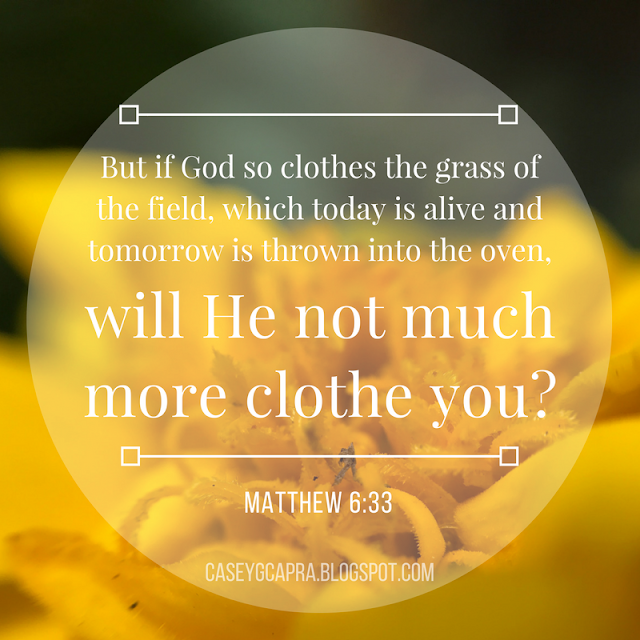 how much more will He clothe His kids? But this doesn't mean anything if I don't believe who I am to Him - a Beloved daughter who is free from the fear of abandonment (Romans 8:15). We can sing "You're a good, good Father," over and over, proclaiming that it's who He is and that we are loved by Him... but until we actually believe that, and we are walking that out with belief, it will change nothing about our daily life. When Jesus shows His disciples how to pray, He teaches them to ask, "give us this day our daily bread," (Matthew 6:9-13). In teaching them this, He is telling them that they can trust their heavenly Father to give them what they need for this day, just like He gave the Israelites their literal daily bread in the desert (Exodus 16). There was never a day those Israelites went without manna. Does this mean I'll be dripping in pearls and endless productivity every day of my life? Nope. It doesn't even mean that some days I will go without, or that our grocery budget might look slim, or that I will end the day without getting something done. BUT I can be confident that God knows what I need. the moment I need energy for what the Lord has called me to do, I will have it. The moment I need the finances to feed my family, I will have it. The moment I need more of His grace to get me through a challenging day, I will have it. He won't give me what I need for tomorrow, nor will I have to rely on yesterday's leftovers (Exodus 16:19-21, Matthew 6:34). In fact, He gives me what I need moment-by-moment, hour-by-hour. My little dude comes in August, and there are many days when I feel like I am falling short of just taking care of myself and my home and my husband. Multiple times Jon has come home to a wife who laments "How will I be a good mother if I can't even get my life together now???" 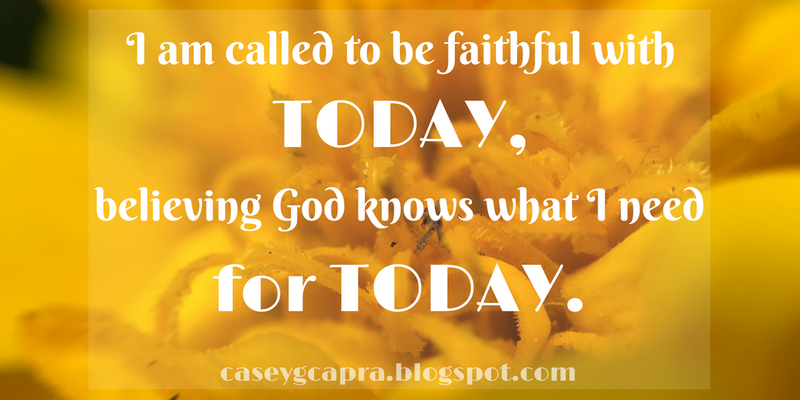 I am called to be faithful with today and believe that God knows what I need for today. I am not going through today on my own, nor I am I called to. Success is not getting everything on my to-do list checked off, success is daily walking out my days with Him, letting Him dictate my agendas, my goals, my to-do lists, my priorities... And depending on Him more and more, knowing that He is fully aware of my needs and fully prepared to fulfill them. And the best part is, this isn't a crutch, or an excuse. It frees me up to just spend my days walking in step with Him, following His heart, and seeking Him above anything else. #goals! What promises are you learning to be more confident in? Thanks for sharing! I struggle with the feeling of being behind before I get up in the morning. This past week God challenged me with the simple verse in Matthew - Seek first the kingdom of heaven and all these things will be added unto you. That is a powerful promise to me because in that I see that if I stop being so concerned about getting the day to day list done and focus more on listening to what He wants me to do each day, He will take care of the lose ends - of the things I'm not getting done. I get this also! I've been trying to grasp with my mind and heart what I get done is God's will for the day. I try my best, but it doesn't break me when things are undone. So important to remember that God is with us and will provide our needs every day. We don't have to worry about the future, because He's got it all under control. Such a sweet reminder of God's faithfulness and provision. Learning to trust Him is a process - at least in my life ;) - and I'm thankful for the grace He provides. Casey, What a sweet heart you obviously have. It's funny, we seem to discuss in my bible study group frequently how we think "all the things" won't get done, but if we just let God take the lead, he'll show us the way. Sounds easy enough, right? Us type A's have a hard time letting go of the reigns. You'll be an awesome mama to that little guy! Have a great day! I feel like you read my mind with this post. But really, I think God put you and your post in my path this week! I have been feeling so anxious and bogged down and my prayers have been full of, bring me peace. Your wise words have done just that! Thank you! This is so good! I am a type A and a mom and I struggle with this all the time, having so much to do and feeling like I have no time to do it. It is all about trust and letting go and letting God.